With the MS admissions just round the corner, you might find yourself preparing and arranging all the relevant documents. What you are typically required to submit in that bunch of documents is the Letter of Recommendation or the LOR. The Letter of Recommendation is as important as your Statement of Purpose (SOP), and can make or break your chances of getting into an institute or even securing a scholarship. A Letter of Recommendation serves as a validation of your achievements and provides a third person perspective of your knowledge, skills and personal attributes. 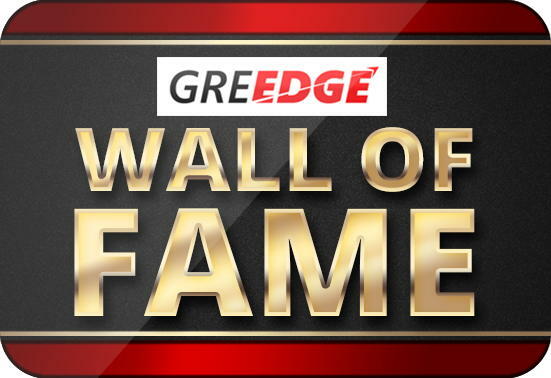 There have been instances where students with below average GRE scores also made it to top universities with amazing letters of recommendation. A letter of recommendation adds valuable insight to not just your academic credentials but also to your personality which helps the admission committee to differentiate you among lakhs of applicants. Shriram Krishnamurthi, Professor of Computer Science at Brown University writes about a student who got into an excellent graduate program with a GPA of just 2.67. He further points out that the student had mentioned the reasons in his letters that made his 2.67 GPA special- ‘he aced hard classes and got bored in easy ones’. He illustrated this with several narratives in his letters which made his application stand out amongst the rest. Harvard Dean of Admissions, William R Fitzsimmons says, “Recommendation letters are extremely important and are read with great care, often commenting on them in writing”. Thus, a nicely crafted LOR which highlights and supplements your academic credentials and provides a glimpse of your personal attributes helps set you apart among scores of applicants and makes your entry to your dream institute easier. As important a letter of recommendation is in securing admit into a top university for MS program, the culture of writing letters of recommendation is almost non-existent in India. This leaves the students as well as the one’s writing the letter of recommendation- professors and employers, confused. While an LOR would be specific and unique for each student, but effective LORs share certain common features that make them unique. Let us look at some important tips to create a great LOR. Even before crafting a great LOR, it is important to decide who should write your recommendation letter. Best recommendation letters are personal and insightful and should reveal your personal character. And someone who barely knows you would not be able to write about you. So, it is important for you to ask someone who knows you well to recommend you. Apart from knowing you well, credentials of the recommend-er is also crucial. If you are a student, a letter of recommendation from the Head of Department or one of the senior professors carry more weight than a letter from a junior professor. If you are working, a letter of recommendation from the head of your division or department adds more credibility to your application. Internship mentor, if you have had internship experience. The Head of your division, if you have had the opportunity to work with him. Writing a great recommendation letter takes time as it provides a multi-dimensional view of the applicant. And one of the fundamental mistakes you might make is to wait till the last moment to arrange your recommendation letters. It is important that “you approach the recommend-er 3 to 4 months before the application deadline with all the necessary details.” It will be easier for the person to write a personalised account of your achievements and accomplishments. It is also important to keep in mind that institutes do not want to know about every quality of the student that makes him great. A recommendation letter focusing on a particular area shows the applicants dedication and commitment towards that field. It is also an indicator of their long-term focus and future potential. Asif definitely must be talented; however, the recommendation letter does nothing to bring out his specific skills that might contribute to his future. This LOR is a mixture of several qualities of the applicant, but does not corroborate any of these. It is a great pleasure to recommend Asif for admission to your college. Asif is one of the most exceptional students I have encountered in the past 20 years of teaching. I taught Asif in his fourth year of B. Tech and he has a keen interest in and talent for Robotics. His advanced skills, passion for the subject, and keen interest for scientific enquiry make him an ideal fit for your rigorous masters program. 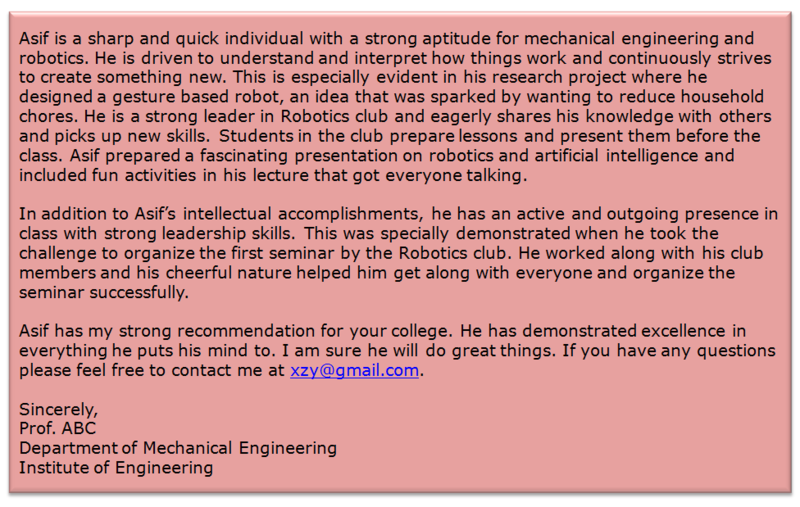 As you can notice, this LOR revolves around Asif’s interest and work on robotics which stands out as the core theme. The recommender, by mentioning Asif’s research project, also validates his project work which would have been an important part of his SOP. The recommender also connects all other qualities with this central theme such as Asif’s skills, passion, and aptitude for the subject along with his personal qualities. A great LOR therefore, need not boast about every skill you possess but can highlight a few important ones which actually fit in with the program you have applied for. For instance, some letters may highlight academic credentials of the applicant if he or she is academically very bright. In other instances, letters may focus on the applicant’s skills in working in teams, or leadership skills. Still others may focus on the applicant’s passion for sports, or music, or art. A great recommendation letter does not just lists data that is already in the resume. It gives a holistic overview of the applicant by encompassing his or her academic qualifications and personal skills along with potential for future success. In doing so, great letters, use anecdotes and narratives that tell the reader about you as a person and what motivates you. Stories are a great way to communicate not just what you have accomplished but how you accomplished. They illustrate your personal qualities and etch a place in the readers’ minds. Himanshu has great organising skills. When three of the students responsible for organising the Robotics event in the annual college festival fell sick in the last moment, Himanshu sprang into action, delegating tasks to other student organisers and working up well into the night to set up the venue and make the technical arrangements. Under his able organisation, the venue was ready by morning and the event concluded successfully. Can you make out the difference? Both examples talk about organizing skills. However, the second example proves his organising abilities whereas the first one does not. The second example paints a picture of Himanshu coordinating with his team and working overnight to organise an event. A story makes a letter more interesting, lively and brings out the character of the applicant. Moreover, stories prove that the recommend-er knows you personally well to assess you. Sharing narratives prove that the recommend-er knows the applicant well and therefore, the recommendation is trustworthy and reliable. While crafting an impressive recommendation letter using stories, anecdotes or narratives, most recommend-ers use the CAR framework. CAR stands for Challenge, Action, and Results and is a framework which highlights the achievements of the applicant in the face of a challenge and actions taken by him or her. Sonia is a young and creative professional who takes challenges head-on. She is an expert coder and has immense knowledge of the field. When our department experienced problems with the front end checkout process, Sonia immediately started working on it. Using her coding knowledge she added a new coding system at checkout for looking up produce. As a result of her efforts sales-per-hour increased from 23 to 38 due to faster produce lookup times. Notice how the recommend-er first wrote about the challenge, then the actions taken by Sonia, and finally the results. This helps in truly personalising the recommendation by highlighting specific achievements of the applicant. Besides using narratives with the CAR framework in mind, great recommendation letters use powerful language. Using cliché words and phrases (such as hard worker, perfectionist) makes a letter very generic and makes it impersonal. Letters crafted using impactful words show that your recommendation letter was created by putting thoughts and efforts. Rishav is a great student. He is very hardworking and dedicated and always goes the extra mile to achieve his goals. Rishav has great analytical and problem solving ability. He showed immense interest in marketing and joined the marketing club of our institute. Using his creative skills, he designed an advertising campaign for a national level advertising competition which placed him amongst the top three creative and innovative advertising ideas. The first example is very generic. Although it tells us that Rishav is hardworking and dedicated, it does not tell us about the outcomes of his hardwork and dedication. If you notice the second, it uses more specific words to describe Rishav’s skills with a specific narrative to prove the point. A great LOR is well organised and includes all the information required to judge the applicant. A properly drafted recommendation letter will mention how well recommend-er knows the student. Introduction starts with an enthusiastic recommendation followed by assessment of the applicant in two or three paragraphs. The recommend-er concludes the letter by reiterating the recommendation and invites the admission committee for follow up questions. Your LOR should be in sync with your application. LOR must substantiate the details in your application and not contradict them. Make sure you spend time with the person recommending you. It is important that you establish a good rapport with the person and share the details of your achievements. You must proof read your LOR for any spelling mistakes. It harms the credibility of the person recommending you and at the same time affects your image too. Your LOR should not be too short! This basically indicates that the recommend-er did not invest time in writing the letter. Universities require two or three LORs. Make sure that all the LORs do not sound similar to each other. We hope this article helps you understand the importance of a LOR and demystifies the truths behind a great one. So, here’s wishing you good luck! Read on to find the Dos and Donts while drafting a Letter of Recommendation here. Admission Diaries – How to target Top Universities with an Average Profile? MS Abroad: When should I give GRE and TOEFL?